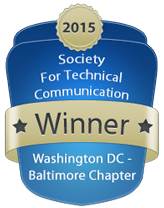 The STC Washington, DC – Baltimore Chapter (WDCB) is pleased to present the list of winners for our local Summit Technical Communication competition. There were 33 total entries this year with a total of 26 winning awards. Entry titles, contributors, and the organizations they represent are shown on https://competition.stcwdc.org/competition-winners-2015-2016/. Entries to our competition this year came from California, Colorado, Maryland, Massachusetts, New Jersey, New York, Rhode Island, Virginia, Tennessee, Texas, Czech Republic, Israel, Italy, and the UK. 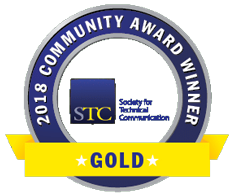 Winners of the Distinguished Technical Communication Award and the Excellence Award are eligible to go on to the STC International Summit Awards (ISA) competition. 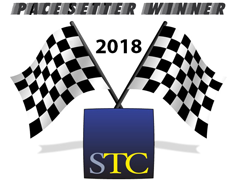 As part of the Distinguished award, the chapter submitted the Distinguished winners to the STC international competition at no cost to the submitters. All winners of the Excellence award may submit their entries using the STC ISA Entry Submission form. Winners in the international competition will be notified before the Society's 63rd Annual Conference Technical Communication Summit to be held 18-21 May 2016, in Anaheim, California. There, all winning entries will be displayed, the international Best of Show awards will be presented, and all international winners will be honored. All net proceeds for the WDCB chapter-level competition go into the chapter's operating expenses and award funds. "TracVision TV-series Technical Training" is the STC WDCB 2015-2016 Technical Communication Summit Awards competition Best of Show, Online entered by KVH Industries, Inc., Middletown, RI. The contributor to this entry is: Mike Nelson. "Johns Hopkins APL Technical Digest" is the STC WDCB 2015-2016 Technical Communication Summit Awards competition Best of Show, Publication entered by Johns Hopkins Univ. Applied Physics Laboratory, Laurel, MD. Contributors to this entry are the following: Erin Richardson, Kelly Livieratos, Diane Dorsey, Ken Moscati, Shannon Nelson, Gloria Crites, Matt Baughmanv. All winning entries will be on display at the Awards Celebration. All entrants, judges, chapter members, friends, and managers are invited to attend. You do not need to be part of the competition or belong to the chapter or STC to attend. You may find some interesting ideas to inspire your work by looking at the winning entries on display. Please join us in congratulating all the winners of the 2015-2016 competitions. Thank You To All Our Competition Judges and Committee Members!